Drs. 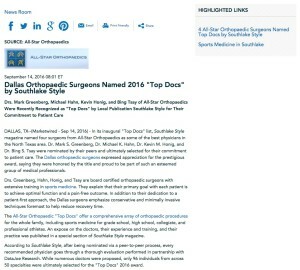 Mark Greenberg, Michael Hahn, Kevin Honig, and Bing Tsay of All-Star Orthopaedics were recently recognized as “Top Docs” by local publication Southlake Style for their commitment to patient care. Dallas, TX — In its inaugural “Top Docs” list, Southlake Style magazine named four surgeons from All-Star Orthopaedics as some of the best physicians in the North Texas area. Dr. Mark S. Greenberg, Dr. Michael K. Hahn, Dr. Kevin M. Honig, and Dr. Bing S. Tsay were nominated by their peers and ultimately selected for their commitment to patient care. The Dallas orthopaedic surgeons expressed appreciation for the prestigious award, saying they were honored by the title and proud to be part of such an esteemed group of medical professionals. Drs. 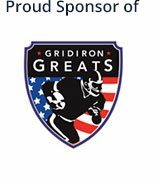 Greenberg, Hahn, Honig, and Tsay are board certified orthopaedic surgeons with extensive training in sports medicine. They explain that their primary goal with each patient is to achieve optimal function and a pain-free outcome. In addition to their dedication to a patient-first approach, the Dallas surgeons emphasize conservative and minimally invasive techniques foremost to help reduce recovery time. The All-Star Orthopaedic “Top Docs” offer a comprehensive array of orthopaedic procedures for the whole family, including sports medicine for grade school, high school, collegiate, and professional athletes. An expose on the doctors, their experience and training, and their practice was published in a special section of Southlake Style magazine. According to Southlake Style, after being nominated via a peer-to-peer process, every recommended physician goes through a thorough evaluation performed in partnership with DataJoe Research. While numerous doctors were proposed, only 96 individuals from across 50 specialties were ultimately selected for the “Top Docs” 2016 award. 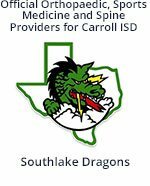 All-Star Orthopaedics is a comprehensive sports medicine and orthopaedic practice with locations in the Irving, Southlake, Flower Mound, and Dallas area. The medical team is led by a collective of eight board certified orthopaedic surgeons specializing in general orthopaedics, foot and ankle surgery, sports medicine, hand surgery, back and neck surgery, and joint replacement. Among the physicians are Dr. Mark S. Greenberg, Dr. Michael K. Hahn, Dr. Kevin M. Honig, and Dr. Bing S. Tsay, who have trained extensively in a wide range of advanced techniques. All-Star Orthopaedics is committed to personal attention, customized care, and state-of-the-art treatment. For more information about Drs. Greenberg, Hahn, Honig, Tsay, and their practice, please visit allstarortho.com and facebook.com/allstarortho.